It’s not uncommon for seniors to experience hearing and vision loss. Sadly, these changes can cause both physical and emotional hardships. They may feel a loss of independence, an inability to do the things they love, and a disconnect from the world around them. Beyond these discomforts, with the loss of vision and hearing, they may experience cognitive decline. Read on to learn more about how hearing and vision loss causes dementia and cognitive decline in seniors. Hearing loss also plays a part in cognitive decline in seniors. The reason for this is unclear, but there is speculation that uncorrected deficits in vision and hearing may accelerate this. A study published in JAMA Internal Medicine in 2013 observed 1,984 adults with an average age of 77. 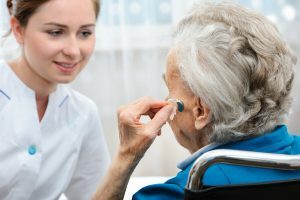 The study confirms that “hearing loss is associated with accelerated cognitive decline and incident cognitive impairment.” Also noteworthy, Adults with hearing loss will experience cognitive decline 30-40% faster than those with normal hearing. But There is Hope for Improvement. Dr. Pershing also said that cognitive function can be improved if vision problems are treated. Regular visits with your ophthalmologist can lead to improvement, and help prevent deterioration. Almost two-thirds of adults over the age of 70 have hearing loss, yet they remain significantly undertreated. Hearing aids are affordable and accessible. Hearing is again possible with treatment. Cognitive decline is a problem for seniors, but now that we know the causes we can help prevent deterioration. With this information, our elderly loved ones can live fuller lives, and tackle future health problems. Cognitive decline in seniors does not need to be a continuing trend. With the help of trained healthcare professionals your loved ones can learn more about their wellbeing, and fight the problems that come with age. Knowledge and proper care are the keys to living a better life. If you would like to learn more about David York, please contact us. Our healthcare services are the best available. We provide transportation, care, and companionship to the elderly, as well as specialty services. For more information about David York Agency’s qualified and compassionate caregivers, contact us at 718.376.7755. A free consultation can help you decide what services will provide the assistance your loved one needs. Also, please like us on Facebook, or follow us on Twitter, Google+, and LinkedIn. We hope to hear from you soon and look forward to providing the very best in care.